A few years ago I saw a documentary about the well-loved characters Wallace and Gromit, in which their creator, Nick Park, was interviewed. He said that he felt as if the characters he had molded with his own hands had already been in existence and were just waiting to be introduced. I can totally concur with that view. After fourteen years since I first put the Stringbabies ideas down on paper, I find it hard to believe that It started life within my own mind, as it has such a life of its own and like all babies, its ongoing life journey is proving interesting. Eighteen months ago, I was exhibiting the Stringbabies books at the Music Education Expo in London, thanks to the generous support of the Soundpost Ltd. whilst there, I was approached by the Chief Executive of Victoria College Exams (VCM) and asked if our two organizations might explore ways of working together. On following this contact up, I was delighted to discover that the team at the exam board had already decided to propose a bespoke qualification for Stringbabies students! Over the following twelve months I had great fun dreaming up a syllabus and award structure. As composition and sight reading are important components in Stringbabies, I felt that they must form the pillars of any syllabus devised. Eventually I had a draft of a three-tier award, starting with the first level, which is aimed at the student who has the most basic grasp of Stringbabies notation and is just beginning to play open strings with controlled bowing. At level one, the candidate is expected to perform three pieces, two of which are basic first Stringbabies repertoire, and the third being their own composition of no more than sixteen beats using a single line of Stringbabies notation. As left hand skills may have not been introduced at his stage, the technique and scales requirement is for the candidate to compose a rhythm of no more than six beats and then play it on two strings of their choice. There are simple aural and sight reading tests using Stringbabies notation. By the intermediate stage (level two) the student will be acquiring some skills in the left hand and the choice of Stringbabies repertoire reflects this; a composition of no more than 30 seconds duration acts as a third piece, and the sight reading and scales similarly reflect the developing technique. Level three is the final stage of the Stringbabies award and at this stage a piece is chosen from the advanced Stringbabies repertoire and also a piece in conventional notation chosen from a list of music drawn from well-known beginners’ repertoire. The third piece is as before, a composition provided by the candidate in either conventional or Stringbabies notation. A full one octave scale is required in two keys using a rhythm also composed by the candidate. Two pieces of sight reading are given; one in Stringbabies notation and the other in conventional notation, reflecting the fact that at this stage the student is moving on to reading conventional notes. Before releasing the syllabus to the public, Stringbabies teaching colleagues were consulted about components of the award and of course the staff at Victoria College Exams had their own input. It was decided that the awards should be assessed by the teacher, who in turn would be moderated once a term by the exam board. This means that applications can be made at any time of the year and that assessments can take place in lesson time, ruling out the need to travel to an examinations centre. In order to be moderated, the teacher submits a recording of the pupil performing on any device which produces a simple and clear recording. For my first Stringbabies award entrants, I used my mobile phone to record and also to take photos of their compositions. It was a surreal experience when the first Stringbabies Award certificates arrived and it still seems improbable. How many people have the privilege of seeing a system they have developed being accredited by an examinations body? It was another landmark moment when VCM notified me of the fact that entries had been submitted by another teacher in a different part of the U.K.
Rolling out the VCM Stringbabies award is still ongoing and it has been wonderful to have a good deal of support in the press and especially from Dame Evelyn Glennie, who kindly passed on the news via her social media accounts. Another significant development this year is Stringbabies going online! We now have a partnership with Charanga to publish the violin and cello books on their music educational platform and it is hoped that this will be up and running by the end of the year. As I mentioned earlier, Stringbabies seems to have a life all of its own, so I really have not a clue what is going to happen next but if it continues to have a positive impact on enabling people of all ages to comprehend and engage with music, I, for one, will be content. My Music Talk Series continues today ‘Cellist Kay Tucker who is the founder and director of Stringbabies. Stringbabies is a method of teaching stringed instruments to young children. It has twice been shortlisted for the Inaugural Rhinegold Music Teachers Awards for Excellence in music education. I met up with Kay recently at Steinway Hall in London to chat about this increasingly popular method of learning. Kay was born in Sheffield, Yorkshire and began studies on the cello at the age of 12, continuing studies at the Guildhall School of Music and Drama. She combines teaching with performing in a piano trio & string quartet and is in much demand as an Adjudicator throughout the UK, having worked at well over 100 festivals including the National Festival of Music for Youth. 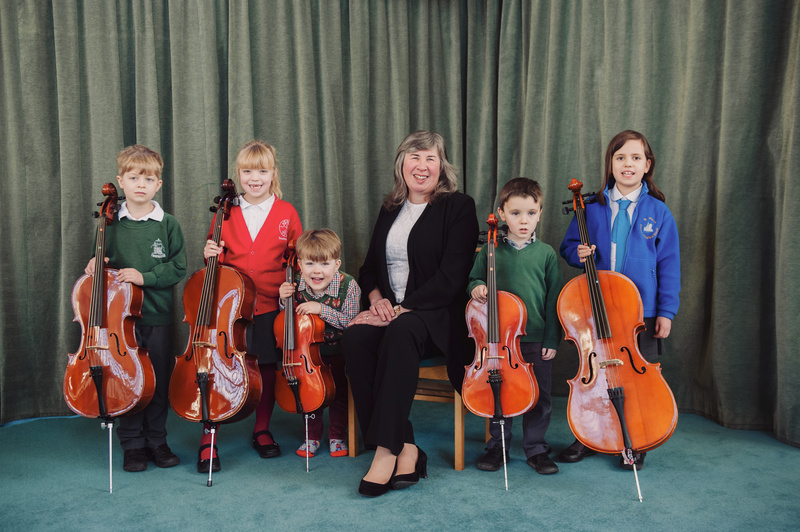 Her teaching experience has covered all age ranges and abilities and her particular passion for teaching beginners led her to develop an early years cello & general musicianship system, ‘Cellobabies’ which along, with a version for violin and viola, is rapidly attracting support & interest throughout the UK and abroad. ‘Stringbabies’ (the umbrella name for this approach) is now being delivered with great success in Surrey Arts, Music for Bedford Borough, Hackney Music Service and Music Cornwall. This work has led to Kay being invited to give seminars and training to teachers all over the UK and Kay is now working on adaptations for Double Bass, Piano, Recorder and Flute, the latter two with colleagues. In 2013, Stringbabies was shortlisted for the Inaugural Rhinegold Music Teachers Awards for Excellence in music education and it has also been shortlisted for the same awards in 2014 in the category of excellence in primary and early years music. Stringbabies is currently involved in four of the new music hubs – Hackney, Surrey West Sussex and Cornwall. Over recent years, Kay has worked as a consultant to Trinity Guildhall, having selected and co-selected repertoire for graded exams and diplomas. Kay became an Adjudicator Member of the British and International Federation of Festivals in 1997 and undertook the Post-graduate Certificate in Adjudication in 1999/2000.